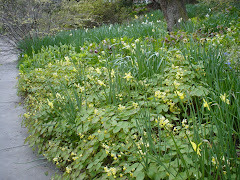 Perennial bed:Clean out the beds of any stalks you didn't get last year. Apply organic fertilizer. Plant shrubs and perennials as soon as the frost has left the ground.Dig and divide perennials, place the min post for an upcoming plant sale or replant them in a new place. Herb and Vegetable garden:Add organic fertilizer and compost and till the soil when it is no longer damp.Plant peas, onions, lettuce, arugula, mache, radishes as well as thyme, chives, tarragon, lavender,winter savory, oregano and other hardy perennial herbs. It is not too late to start tomatoes, peppers and eggplant seeds indoors to plant in the garden after Mother's Day. Shrubs:Prune rose bushes and hardy hydrangea such as H. arborescens 'Annabelle' which can be cut flat to the ground if necessary and will still produce blooms this summer.Prune fall blooming clematis and butterfly bush (Buddleia davidii)Cut forsythia branches and bring them indoors as a bouquet. Trim the remaining branches for better shape.